1. 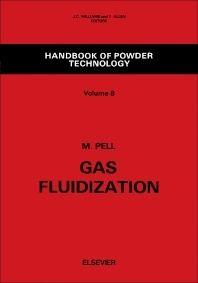 Introduction to Gas Fluidization. Introduction. Regimes of fluidization. Effects of particle size and density. Effects of gas density and viscosity. References. 2. First Calculations. Average particle size. Experimental evaluation vs. calculation. Minimum fluidization velocity. Minimum bubbling velocity. Terminal velocity. Bed expansion. A second look at the minimum bubbling condition. Bed pressure drop. References. 3. Gas Distributor Design. Functions of the grid. Grid pressure drop. Hole size and number. Jet length. Particle attrition. Grid variations. Grid seals. Plenum design. References. 4. Bubble Growth and Stability. Overview. Bubble growth. Slugging. Maximum stable bubble size. Effect of bubble size on bed expansion. References. 5. Mixing and Segregation. Solids mixing. Mechanism of vertical mixing. Radial mixing. Diffusion model for solids and gas backmixing. Segregation. References. 6. Heat Transfer. Introduction. Particle to gas heat transfer. Particle to wall and tube heat transfer. Design considerations for tube banks. Radiation. Heat transfer by entrained solids. References. 7. Drying and Solvent Stripping. Introduction. The drying curve. Design considerations. Designing for residence time effects. Vibrated bed drying. Vendor assistance. References. 8. Entrainment. Introduction. Particle ejection from the bed. Transport disengaging height, TDH. Correlations for entrainment above TDH. Entrainment below TDH. References. 9. Chemical Reaction Modeling. Introduction. Historical background and evolution of the model. Description of the model. Effect of fines. Grid region effects. Freeboard region. Baffles. References. 10. Scale Up and Scale Down. Introduction. The scaleup sequence. Large scale effects. References. 11. Defluidization and Agglomeration. Introduction. Defluidization from thermal sintering. Intentional agglomeration. References. 12. Attrition in Fluidized Beds. Attrition fundamentals. Time effects on attrition. Attrition tests. Design procedures. Designing to minimize attrition. References. 13. Physical Forces. Effect on particles. Effect on internals. Effect on the vessel and associated equipment. References. Appendix: Units and Symbols. Index. This book is a much-needed fluidization handbook for practising engineers. There are few plants which do not have a fluid bed process operating somewhere on the site, yet engineers rarely have any formal training in the subject. College courses often emphasize academic issues rather than industrial needs, and a study of the literature reveals an overwhelming abundance of correlations and experimental data. As this is a practical book, the author has minimized theoretical development of fundamental equations in favor of giving correlations which have been developed for large scale equipment. In some cases, where several correlations might apply, the author has chosen one or two which work best according to his own experience. Design procedures are described which should assist the designer and the operator of fluid beds to improve his process and to avoid some often-encountered pitfalls. The material will also be useful as a supplementary text to a course on fluidization, the emphasis on commercial design being a stimulating counterpoint to a strongly academic viewpoint.